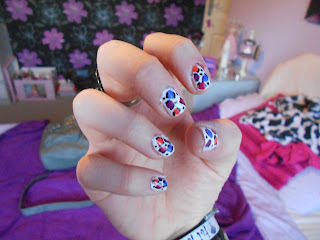 Today I’ve got a quick NOTD for you today. Im really impressed with how these turned out. So without further ado let’s get on! Step 1. Paint your nails with the white polish and leave to dry completely. Step 2. 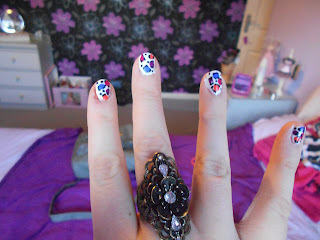 Pour a bit of each colour onto the metal tin and using your brush put a dot of each colour on each of your nails. Step 4. Add some dots of black if wanted then paint with a glossy topcoat. They look fab, very artistic. Cute nails! Will definitely try them out. Love your ring as well!